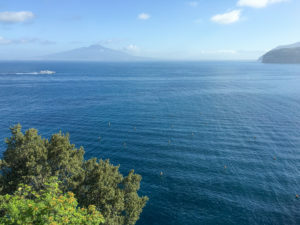 If you’re looking for things to do in Sorrento, Italy, then here’s a partial list of activities. 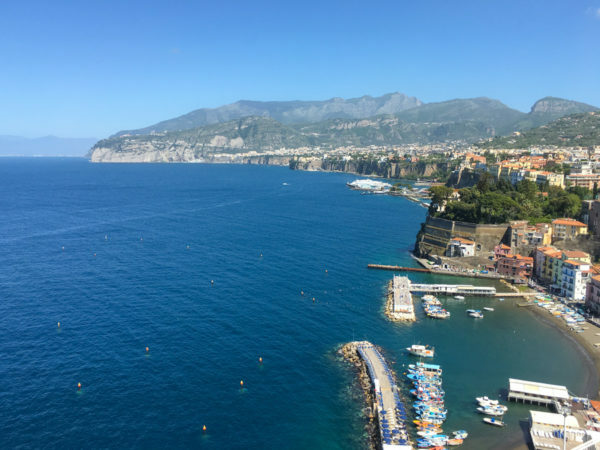 When you’re done exploring the Amalfi coast line and boating off to Capri, settle down in serene Sorrento for some relaxation, people watching and shopping. The natives seem to keep a watchful eye on Vesuvio (the Italian name) and there’s no wonder. It’s considered to be the most dangerous volcano in the world since the next big eruption could potentially wipe out about 3 million people living nearby. The Italians produce some of the most beautiful tiles in the world and they can be found most everywhere in Sorrento. Shrines to Mary are scattered throughout Sorrento and you’ll stumble upon them unexpectedly. They’re all unique, special and charming. 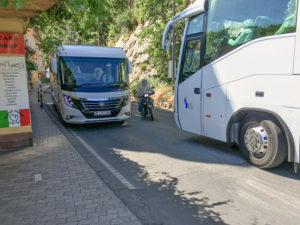 While walking on the sidewalk I witnessed a tour bus challenging a mobile home for passing room on the narrow cliffside highway. As the drivers attempted to negotiate how to get past each other, impatient cyclists (both motorized and non-motorized) were zooming through the gap between the vehicles at a high rate of speed. Apparently these jam-ups are commonplace. Notturno makes very beautiful handmade boxes, furniture, chess boards and other decorative items in Sorrento. 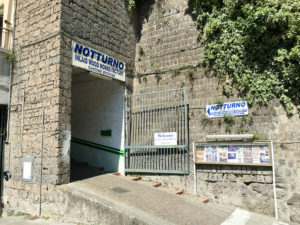 The factory is located up the hill (away from the Bay of Naples) from the piazza. Signs pointing the way are posted in the square and along the street. They keep the lights turned off in the showroom to conserve energy if there are no customers, but just walk in and they’ll turn them on so you can see everything. Items are tagged with prices but substantial discounts are offered — especially for cash. 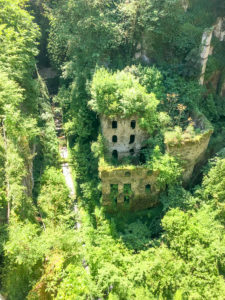 Just up the hill from the piazza (very near the Hotel Plaza), be sure to look over the bridge railing and peer down in the deep ravine for a dizzying view of the abandoned mill. Enjoy some wine and aperitifs at any of the cafés surrounding the piazza, or just sit on a public bench, and watch the world go by. The beautiful Sorrento Men’s Club is the meeting place for retired working class men to socialize, smoke, play cards and gossip. Strictly no women allowed. The colorful shop windows on the Corso Italia in Sorrento change often (sometimes daily) and display some of the best Italian fashion for both women and men. If shopping is your thing, then Sorrento is your place. Avoid the tourist grade sidewalk merchandise imported from China and look for locally made items in the narrow side streets such as scarves, hand towels, ceramics, leather goods and inlaid wood items. A. Gargiulo & Jannuzzi, the large multi-level shop located just off the piazza behind Bar Fauno, offers exquisite linens and ceramics from various regions of Italy. Jolly Market on Via Capo (just past the Grand Hotel Capodimonte) sells beautiful and unusual three-dimensional hand-made die-cut greeting cards along with wines, beverages and snacks. After 3pm, the sweet yellow labrador named Jolly is usually there to greet you. The building that houses the market looks like a tall, very thin castle. Sorrento is full of churches and cathedrals and the artistic beauty they contain endures. The Italians are masters at carving, painting and embellishment and you’ll find delightful detailed door handles, knockers and artwork on doors around Sorrento. Just stroll and look to find beauty everywhere. Stroll through the lemon grove (L’Agruminato) which is located on Corso Italia across from Pizzeria Da Franco. You can also sample and purchase limoncello and mandarin liqueur at the little market stand inside the grove. In fact, I love the limoncello from L’Agruminato so much, I wrote an article about it. The sleek, modern bar at the Hotel Plaza in Sorrento offers cocktails from early afternoon into the evening. Martini cocktails are well made and little nibbles are provided along with drinks. For an afternoon wine break, stop into The Garden wine bar on Corso Italia for a refreshing glass of prosecco. From around April 23rd through the rest of the summer season, Sorrento closes off traffic to the main thoroughfare daily at 7pm and people stroll in the street, socialize and window shop. It’s a delightful way to begin the evening before heading to dinner. Italians love their dogs and in many ways they seem to be people, too. It’s common to see a pooch off leash relaxing on the sidewalk alone and then suddenly, it will trot off somewhere on a mission. Thankfully, the dogs all appear to be well cared for even though they are doing their own thing. Enjoy cappuccino in the morning and espresso and gelato in the afternoon. 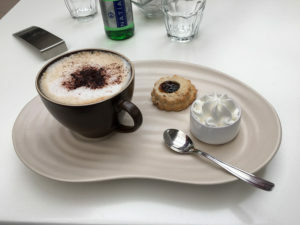 Order your espresso as usual by saying “un café” at the bar, but in Sorrento they want you to pay first at the cashier and present your receipt. As found most everywhere in Italy, the Gelato and pastry selections are mind-boggling and mouth watering. Just choose something and enjoy the treat. Join our mailing list to receive the latest blog posts from Paul. We won't give your information to anyone else and there's no spam ever -- and that's a promise.